Here are five proven tactics that nearly guarantee success for becoming a mobile dentist. While careful planning is not a guarantee that your mobile program will succeed, without it your program has no chance for success. So the Ronald McDonald House Charities® of the Ozarks in Springfield (RMHC) contacted local professionals to learn how to address a significant oral health need for children in the community. “And we were able to start the Tooth Truck, our local Ronald McDonald Care Mobile program.” Muñoz says. It’s important to have cooperation. Mindy Muñoz adds “Over time, we aren't viewed as competitors to local dentists. The children that we're seeing wouldn't often receive treatment from local dentists due to barriers preventing them from going to a free-standing dental clinic. So we don't compete, we collaborate.” And when major procedures are required, mobile programs will often refer the patient to local dental specialists. 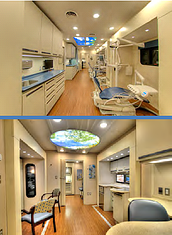 Mobile dentistry units have smaller office and treatment spaces and the staff needs to be able to work together in these settings. In addition, the team should be those whose personal values align with the mission of working with and for underserved people in the community. From the start, it’s important to gather meaningful statistics on the needs in your community and ensure those needs are reflected in your program’s results. Your funders will require that you demonstrate the value of your program. They will want to see documented evidence of success and even shortfalls, and what plans you will put in place for improvement as your program matures. Establishing and sustaining your program will take funding from many sources. From seeking funding from local and national philanthropic foundations, to dental insurance companies who have giving arms, there are many resources to support community health programs. And many of these organizations often exist to primarily to asset in programs that provide improved healthcare to underserved populations. Mobile dental clinics can operate in broad geographic areas and target specific demographics, which may be impossible for fixed dental facilities. 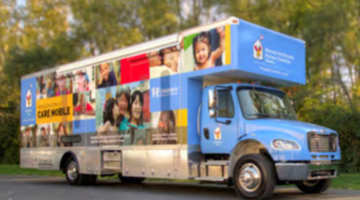 In addition to local hospitals and national organizations, many dental practices expand their services to include mobile clinics to serve outside of their normal geographic footprint. Mobile vehicles also help market a practice or hospital by operating as roving billboards and displaying their contribution in helping serve the community. Having dental trucks as part of their business helps bring in new patients, ultimately increasing their revenue stream. With initial due diligence, efficient record-keeping, adequate funding and an effective marketing plan the return on investment is significant when implementing a mobile dental care program. Not only from the billed services provided through the mobile unit, but also the referrals back to the institution (dental practice, government backed organization, clinic or hospital). Click the button below for more information on establishing a “Winning Mobile Dental Care Program”.